In many Anniversaries mark time but they are also opportunities. Couples often take this time to recommit to each other and take stock of where they stand with regard to their mutual goals. So whether you are just noting the day or viewing it as a time of renewal, it's an important occasion, and one made for jewellery-giving. Traditionally, anniversaries have had specific goods like linen or bronze designated as appropriate gift material for each year, and it is still okay to follow that course. Details about that can be found here. (http://en.wikipedia.org/wiki/Wedding_anniversary) But it is also appropriate to bestow jewellery at any anniversary, particularly if the idea of giving something like paper or leather goods does not appeal to you. The more modern version of this list, in fact, has jewellery replacing some of the older categories. Everyone, it seems is happy to receive jewellery as a gift whatever the day. The bottom line is that you can't go wrong with jewellery as an anniversary gift! For spouses, the general trend seems to be that the jewellery gets more elaborate as the years pass, signifying the growth of the relationship. While some men opt for romantic themes like heart shaped motifs in their gift choices, that is not a requirement or even an expectation. Any piece of jewellery -- a pendant, ring or pair of earrings -- in diamond or gold is right just about any time. The more savvy spouse will choose something that complements or matches jewellery from a previous year. That shows a level of thoughtfulness that does not go unnoticed. Of particular note, though, are the "major" anniversaries, usually those denotes a decade or a quarter of a century. 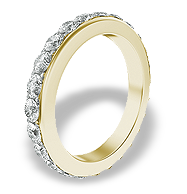 These are universally considered signifiant milestones and hence are occasions for jewellery that reflect the importance the number. Husbands who have been giving earrings and bracelets as gifts over the years might consider this the time to spring for a necklace, one that will not only delight your spouse but will garner compliments from her envious friends. If a wife has not been bestowing jewellery on her husband at anniversaries might take this time to present him with a set of cufflinks that will really make him stand out. After all, everyone has occasion to really dress up at least a few times each year. Those wishing to mark someone else's anniversary should feel comfortable giving jewellery of any size and scope. It's the intent here that is important.